Do you empty the room when you walk in? Do others find you uncommunicative or temperamental? Is it hard to admit when you’ve made a mistake? Would you rather die than ask for help? It's not a guy thing—it's a bushido thing. In this follow-up to her acclaimed self-help book Why Smart People Do the Same Dumb Things, respected Hawai‘i psychologist Dr. Rosalie K. Tatsuguchi explains the thought behind the bushido paradigm and teaches how to know when you should be a stern samurai, or when you should give and accept intimacy. Learning this process of behavioral change can open the door to better relationships with your peers, friends and family. Dr. Tatsuguchi’s unique approach is rooted in both modern scientific methodology and in Buddhist principles of respect for the human spirit. 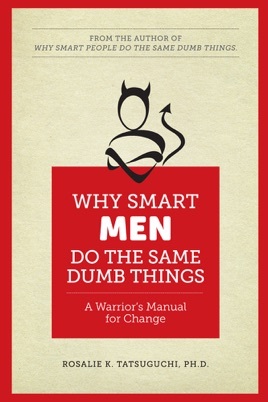 Why Smart Men Do the Same Dumb Things will help you realize when the way of the warrior works—and when it doesn’t—to help you live a happier, more fulfilling life. Rosalie K. Tatsuguchi, PhD. has maintained a private practice in Honolulu since 1983. In addition to a Ph.D in Psychology, Dr. Tatsuguchi has an M.Ed. in Educational Psychology and a B.A. in Philosophy and Asian History. A member of the American Psychological Association and certified by the Council for the National Register of Health Service Providers in Psychology, she counsels children and adults, including couples of many different ages, ethnic backgrounds, socioeconomic levels and religious beliefs.